I spent a fair amount of time searching but didn’t find many articles talking about migrating from wordpress.org to wordpress.com. Here’s my story. In all the iterations of my website, I have to say I have truly fallen in love with WordPress. The platform is open, extensible, and approachable.WordPress isn’t just for blogs. WordPress truly changed the way small websites are built. According to WordPress, they power 23% of the Internet. With the pervasiveness of the platform, I don’t challenge that statistic. When I launched my first WordPress blog, I used a small hosting provider at $3.95 a month. It seemed to be the right amount of horsepower or the scale I was running. The problem with shared hosting is that it shared. More sites got placed on the same hardware and performance got worse and worse over time. I was able to resolve slowing performance with the caching plug-in. Then I added a static IP with SSL certificates to ensure everything was airtight with regards to passwords and security over the wire. Then my site came under attack from a number of overseas threats. Christmas break went to cleaning up the damage by restoring from backup. I love the extensibility of the WordPress platform, but plug-ins do come at a cost. They need to be updated and maintained otherwise out of date code can leave your site vulnerable. Through all of it I realized one thing: creating content became increasingly harder to do. Sure, I can work through and configure all of the technology to do what I wanted to. The problem was it was taking away time from blogging. I didn’t want to spend weekends figuring out why the CSS on the latest Facebook widget wasn’t rendering on my site. There had to be a better solution. WordPress has two major offerings: managed hosting (wordpress.com) and self hosting (wordpress.org). For just about my whole blog’s life I have self hosted it. I was ready to jump to the other side of the fence and join forces with Automattic, the commercial arm behind WordPress. What makes wordpress.com attractive to me? WordPress.com is fast. I became sensitized to the 5-15 load time of my old site on BlueHost. I would usually fail many of the webpage speed tests as BlueHost just didn’t have enough CPU power on their shared hosting plans for any given blog. I could’ve upgraded to a dedicated server plan, but it just didn’t seem to be a great use of money. I just don’t get THAT many hits. The team at wordpress.com spends a lot of time optimizing WordPress, their servers, content distribution and making the experience slick. I don’t have to wait several seconds for every click around the administration interface. This rocks! On my old site I have four things which needed to be updated on a regular basis: WordPress itself, plug-ins, my theme, and my theme’s framework. Every time I would login something would need to be updated. On wordpress.com you have a limited set of plug-ins and themes to work with, but you are ensured those plugins are automatically kept up to date and are secure. Technology is always changing. There always seemed to be some loose end that would break after a plug-in update. One time, a theme vendor shipped a “bug fix” release that required the rebuild of the entire website. With every update you have to take it to stay secure, but deal with the fallout resulting from changes in the code base. To make matters worse, BlueHost is getting popular. At first their support was outstanding but now queues are usually 30 to 45 minutes before you can speak to someone via online chat. Automattic, the company behind WordPress.com has a team of happiness engineers focused on keeping their customer base happy, engaged, and productive. I was thrilled to see a small widget pop-up in the WordPress administration screen for live support. Talk about awesome! It’s important to me to always be connected with my content. I respect the fact that WordPress is an open platform. I can export my content and import it into a self hosted blog or another platform. I’m not locked into their technology. Finally, the WordPress team keeps their servers backed up and secure. Options like two factor authentication are available by default. In other words, stuff just works. That’s really nice to know you have really smart people focusing on things so that you can focus on content. With WordPress.com you clearly get less functionality. In almost every respect, that’s a really good thing for the casual blogger. I don’t need every bell and whistle. There are though, a few things to call out that have become pain points. This one has to be my single biggest gripe. When I transferred my domain over to WordPress.com I quickly realized they were redirecting from http://www.danradigan.com to danradigan.com. The entire Internet begins with www. Why are they choosing not to honor that time tested tradition? While seemingly innocuous, all of my social shares and counts vanished into thin air. WordPress support is really good, but saying “just let your karma build up back again” or go back to a self hosted blog didn’t seem like great answers. With self hosted blogs, it is easy to have evergreen file storage on the server’s hard drive. By default, every upload and WordPress is assigned a directory with the label /year/month/filename.xyz. When updating assets to use in the site’s user interface on related to content it’s irritating to have “/2015/03/error.png” in the site’s CSS. It would be awesome to have static file storage inside of the media library that is not date stamped by WordPress. The wordpress.com team maintains a tight list of plugins and themes for use on wordpress.com sites. About 90% of what I used was there figured the last 10% wasn’t worth fighting over. If you’re moving a site from wordpress.org to wordpress.com ensure you’re really comfortable with this list. 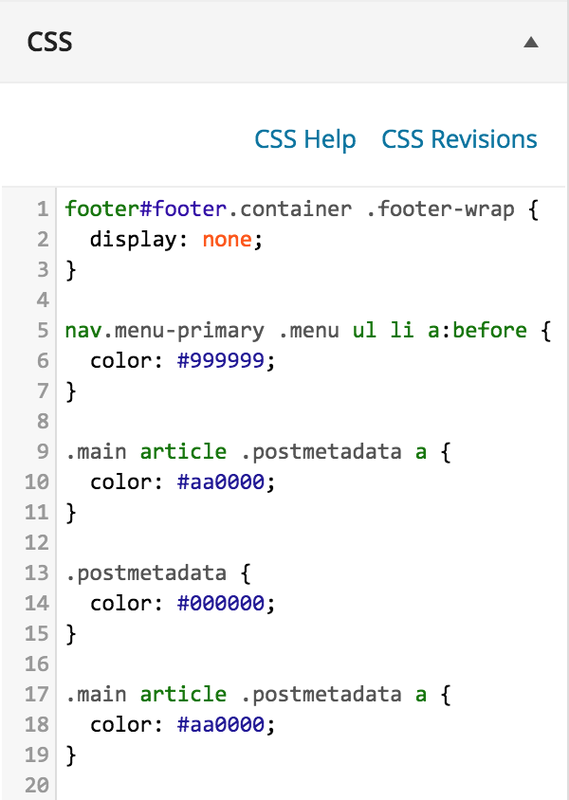 Users can pay a fee to add in custom CSS for their wordpress.com sites. In many ways, I was impressed with how much I could do using only CSS to modify my site. The trick comes up is choosing the right theme when building your site. For me, I really liked the layout of Chronicle ($79) and was able to tweak many styles to add in the rest of the visual look and feel I was after. Sure, thumbnails on the homepage are smaller than I would like. The slider doesn’t have as many articles in it as my old one. That being said, I still think it was the right trade-off for me to move to wordpress.com. On myself hosted blog, I was using the plug-in Subscribe2 for email notifications when I posted a new blog. WordPress.com has a really slick widget to encourage readers to sign up. Unfortunately, you can’t import a list subscribers to a self hosted blog. Thus, I’ll have to beg my subscribers to resubscribe to my new blog. When moving between any two platforms, issues are bound to come up. I’m finding I’m having to do a bunch of cleanup after the importer didn’t migrate a bunch of attachments over. While I’m doing that migration I’m also finding some technical debt that got left after other migrations and even the occasional spelling error :). That being said, my one gripe thus far in the bug department is the incorrect handling of HTML entities, particularly &amp;. I’m finding it’s not handled properly in links (w=1024&amp;h=768) in a link and in the title of the blog (B &amp; B). I’m looking forward to focusing on content again. I’m going to give wordpress.com trial for a few months. I figure I can always move back to my old host if things don’t work out. I’m hopeful though this is the right move.